Mode:Green designs and installs guest-experience enhancing technology in top hotels and large commercial venues, including audiovisual systems, room automation, sustainability technologies, and backend hotel operational systems. Mode:Green selects best-of-breed devices to suit each hotel’s installation needs and vision, supported by close collaboration with other design, engineering, and architectural teams to deliver projects on time, on budget. 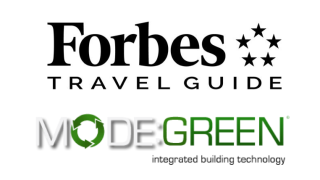 “We are pleased to have Mode:Green as the Official Technology Integrator of Forbes Travel Guide,” said Gerard J. Inzerillo, CEO of Forbes Travel Guide. “Mode:Green assists hotels in seamlessly handling the details that ensure guest comfort. From intelligent lighting, music, and climate control to helping housekeeping and maintenance field requests, the company focuses on improving the guest experience." During 2017, Mode:Green completed installations at the Kimpton Seafire Resort & Spa in the Cayman Islands, as well as the 1 Hotel Brooklyn Bridge Park, New York. The Kimpton features in-room automation of the lighting, temperature, and shading systems, with customized room settings that guests can easily activate with one button press. Mode:Green also continuously adds new technologies to its repertoire, including partnerships with top brands in hospitality technology.